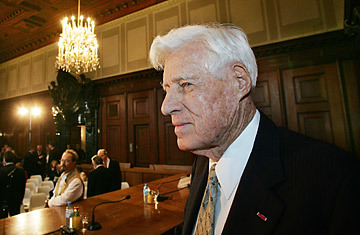 Whitney Harris, former U.S. prosecutor during the Nuremberg Trials, looks around in the historic courtroom in Nuremberg, Germany in 2005. Whitney Robson Harris, the last surviving prosecutor who appeared before the International Military Tribunal at Nuremberg, died at his home in St. Louis on April 21. He was 97. Harris assisted in the cross examination of Nazi defendant Hermann Goring at Nuremberg and later wrote Tyranny on Trial, a monumental account of the major war crimes trial. Harris, a Seattle native, attended the University of Washington and the University of California at Berkeley Boalt Hall School of Law. As a young lawyer, he was in private practice in Los Angeles. Following Japan's attack on Pearl Harbor, he enlisted in the Navy. During his World War II Navy service, he was recruited to the Office of Strategic Services (OSS), where his assignments included work relating to war crimes. He joined the allied war crimes legal team as the war in Europe came to a close. At Nuremberg, Lt. and U.S. Trial Counsel Harris was chiefly responsible for the prosecutions of defendant Ernst Kaltenbrunner, former Chief of the Reichssicherheitshauptamt (Reich Main Security Office). Whitney Harris also was a principal, trusted aide to U.S. chief prosecutor Justice Robert H. Jackson and assisted him throughout the trial. Harris also participated in the interrogations of former Auschwitz concentration camp commandant Rudolf Hoess, who claimed that 2.5 million people had been exterminated under his supervision. Following Nuremberg, Harris served as Chief of Legal Advice during the Berlin Blockade and, later, as a law professor at Southern Methodist University, as director of the Hoover Commission's Legal Services Task Force, as the first Executive Director of the American Bar Association, and as general solicitor of Southwestern Bell Telephone Company in St. Louis. He also became a generous philanthropist, including at Washington University in St. Louis. In recent years, Harris devoted his energies primarily to speaking, writing, and teaching in the area of international law and justice. He was a strong supporter of modern international tribunals, including the court for the former Yugoslavia, the court for Rwanda, and the International Criminal Court. "We should not fear," said Harris, "to establish the principles of law which will permit civilization to survive." John Q. Barrett, professor of law at St. John's University, is writing the biography of Nuremberg chief prosecutor Justice Robert H. Jackson. See TIME's covers on Adolf Hitler.